This week we get to meet the New Zealand half of Kazzalblue - Joy Doggett. 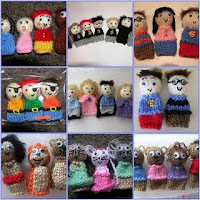 Knitter and creator with her twin sister of baby and childrens knitwear, handmade toys, totes and wallets... all to be found on Felt, Etsy and her website. Kazzalblue is a sister act. My twin sister - Karen (Kazzalblue) - and I - Joy (Jazzalblue) - formed Kazzalblue Baby and Childrens Boutique in order to sell our creations to the big wide world. 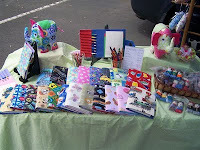 It all stemmed from a very creative mother from whom we caught the 'handmade bug'. I knit and sew as well as playing with paper. I also like the thought of drawing old buildings in pencil - but its been a few years. Now I am working on the Sarah Moon's 'The Bride', a counted cross-stitch. My touch lamp, a book - An Echo in the Bone, a paper mache coaster, a pretty blue pendant I bought in Japan and my water bottle. I love reading about other creative people and how they go about their businesses. I collect old Jean Greenhowe knitted toy books and love combing her pages for inspiration. But my main inspiration is really my sister, Karen, because she has such great ideas and can make anything happen. Books and travel. My sister and I talk endlessly about our business and its direction and our handmade crafts. 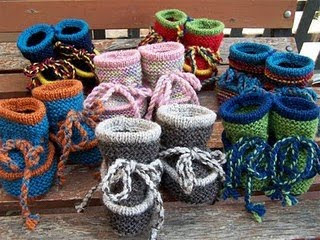 I would love to go to anything crafty minded. Just walking around a market can give you motivation and inspiration. Working fulltime and growing a business which stems from an out of control hobby does tend to keep me busy. Exercise is a key component of staying in command of a hectic schedule - and sleep! Luckily most of my screwups are fixable or I just start over. I am very lucky to have a room I call my studio. My husband decided this was a better option than my taking over the lounge. He even bought me custom made shelves. -Be able to live close enough to my sister (that means in the same country) that we could work together to open our own shop while continuing to build our online presence. -Be able to spend more time on Kazzalblue. -Build a Kazzalblue Boutique website - on the agenda for this year! -Take a graphics design course. -Take a computer course - so I actually know what I am doing and it's not by a random stroke of luck when something works out. Wow awesome to get to know you better Joy! Thankyou!